It’s strange how a news making event can have sudden unforeseen effects elsewhere. In this particular case it was an act of vandalism where one of the Holy Thorn Trees of Glastonbury was hacked down one night in December. The Glastonbury Thorn is associated with the legend of Joseph of Arimathea and the arrival of Christianity in Britain. The legend suggests that Joseph of Arimathea who is mentioned in all four gospels, visited Glastonbury with the Holy Grail. The legend continues that he thrust his staff into the ground at Wearyall Hill which subsequently grew into a thorn tree. The tree was cut down as a superstitious relic during the English Civil War but not before several cuttings were secretly propagated and hidden around Glastonbury. One of the cuttings eventually replaced the destroyed tree on Wearyall Hill with two others being located within Glastonbury Abbey and the Church of St John. By long tradition a flowering sprig is sent to the British Monarch every Christmas to adorn the table used for their Christmas dinner. One of my hobbies is to publicly share photographs I have taken on Google Earth. I do this by publishing them on a website known as Panoramio.com which is now owned by Google and the photographs subsequently appear on Google Earth with some also appearing on Google Maps for the world to see. I should stress that none of my photographs lay claim to be great works of art, I simply recognise that people often like to see photographs of given locations of interest. If you use Google Earth, ensure the photos box in the Layers menu is checked to see the photographs. By chance, one of my photographs is of the Holy Thorn in Glastonbury Abbey and is one of only two submitted to Google Earth at that location. Although a statistics counter on the Panoramio website shows a slow but steady trickle of views for this photograph, a sudden sharp spike of views shows for the two days following the vandalism of this tree. To me this tends to indicate how the internet is used globally by people seeking additional information on news making events. I do not yet know the fate of the cut down Holy Thorn tree but I do hope it will re-grow. I do however find it sad that an act of vandalism by either a mindless thug or someone with a warped grudge can destroy centuries of history in an instant. Not in Somerset this time but in our adjoining county of Dorset where we have many friends. 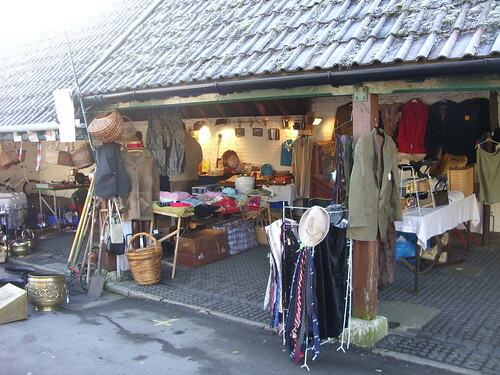 Occasionally we like to go to the weekly market in Dorchester the County Town of Dorset. Dorchester is a small pleasant town with plenty of Roman artefacts around the place and was the home of Thomas Hardy once he became established as a prominent author. The market is a bustling place held on the site of the old cattle market. Some of the cattle stalls are used as mini-shops on market days and the cattle auction ring is used as a farmers market. A large modern wooden building houses an equally large flea market which I find a fascinating place to potter about in looking at curiosities. One of the reasons my wife and I go there is to bulk buy various bird feeds for our garden. Once we have finished in the market, we frequently take a drive to Weymouth a short distance to the south to buy fresh fish, crabs, oysters and scallops from a fresh fish shop located on the quayside of Weymouth Harbour. Our drive took us along the line of the old Roman Road past Maiden Castle, a huge hill fort the Romans once occupied and over the hill range with a hairpin bend down towards Weymouth. Running parallel to the main road is a new relief road being built to help ease traffic congestion. 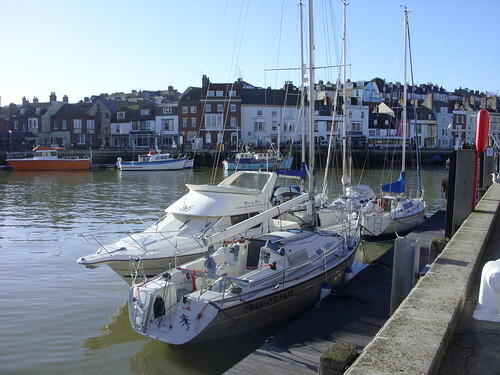 Weymouth is the designated location for sailing sports in the forthcoming 2012 Olympics. I anticipate that the Olympics with attract a huge amount of additional traffic to Weymouth and this has raised an as yet unanswered question in my mind for some time. Anyone who knows Weymouth and its busy shopping centre will understand how difficult parking is even in the middle of winter. In the summer months the parking problem is greatly exacerbated with holiday makers staying in this popular holiday town. I cannot but help wonder where all the additional parking for traffic generated by the Olympics is going to go. I have asked this question of a number of friends who live local to the area and all give the same reply, they simply do not know. I did a quick internet search on this subject before writing this article but found there was a dearth of information o the subject. There seems to be a lot of reliance on public transport but proposed Olympic viewing locations are a reasonable distance from the railway station. I suppose some provision for parking has been made somewhere but as yet I have not found it. I certainly will not be going to watch the sailing events not because I would not like to but concern over parking plus high ticket prices are powerful deterrents. It makes me wonder why as a UK resident whose taxes have already helped finance the building of Olympic locations, that I should have to pay to stand in the same locations I stood today for free.